Thanks so much, Carlee. This fruit pizza was one of the easiest things I’ve created in a long time and everyone loved it at the party. I hope you give it a try. 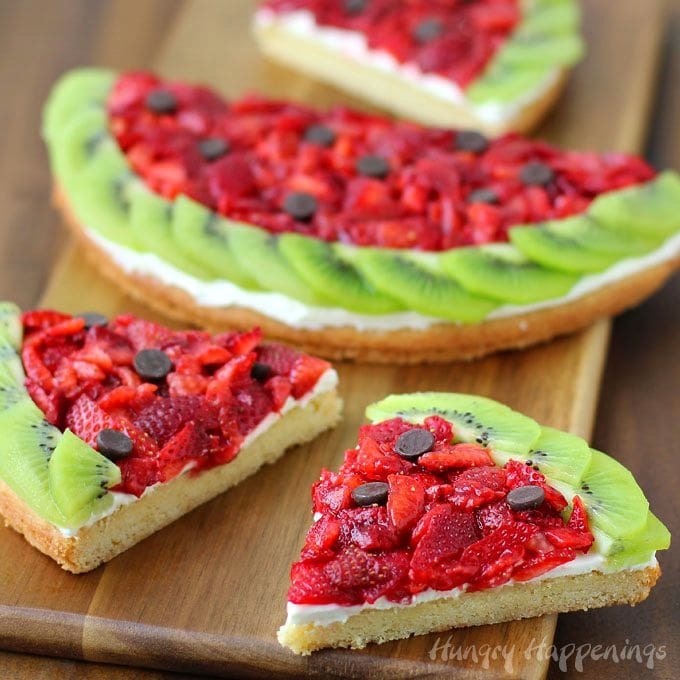 Your beautiful strawberry kiwi pizza has been calling my name every day since you posted the photo. Oh my – cream cheese, marshmallow fluff AND whipped topping. Better than I even imagined. People are going to dive into this the minute they see it. It’s sooo pretty and sounds delish. Thanks for sharing this fun dessert with us at the pool party. The girls can’t stop talking about it. We all loved it and had so much fun spending the afternoon with you at the pool. I’m always happy to share and love spending time with you and the girls. It was so nice of you to share your lovely pool with me for the day. 1. Does the cookie crust get moist from being refrigerated? What do you imagine would be the max time you could leave it in the refrigerator before adding the fruit? I’m wondering if it’s left un-assembled you wouldn’t have to refrigerate it. Once you add the cream cheese – it must be refrigerated. But then – you’d be scrambling to assemble it which you kinda have to do anyway because of the fruit. 2. Would it make the fruit last longer if you put a glaze (of jelly) on top? I don’t particularly like the look of that. Bakeries do it and, to me, it makes the dessert look artificial. Thanks, Tavette. This fruit pizza was one of the best things I’ve made in a while. Everyone loved it. Yes the cookie does get soft in the refrigerator, but that works well so that it’s easy to cut into slices. 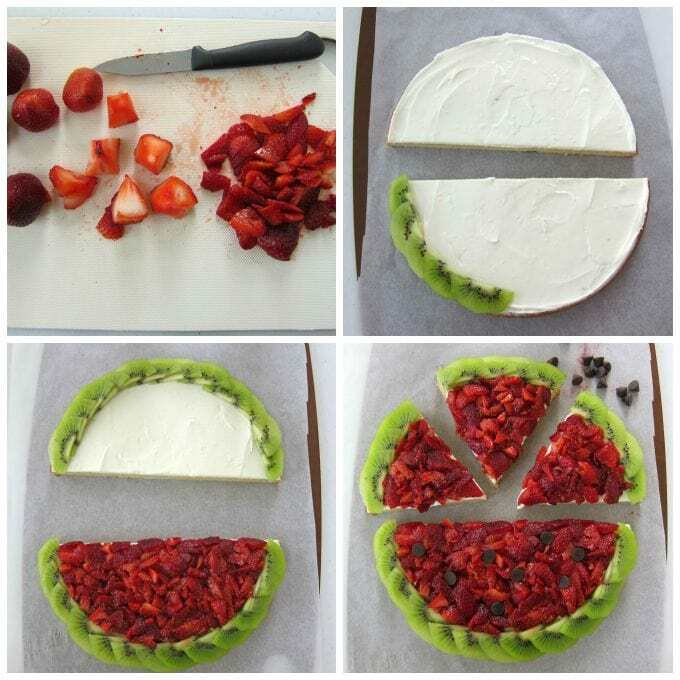 It only takes about 20 minutes to cut the fruit and assemble the fruit pizza, so you could wait until the last minute to decorate it. I don’t like the look of glaze and agree that it looks artificial. I think you’d loose the watermelon look to the dessert if you brushed the fruit with it, but that’s just my opinion. It would work to keep the fruit looking fresh longer, so if you really needed to make this many hours in advance that might help. This recipe makes two fruit pizzas and I made one about 5 hours before we ate it and the strawberries got very dark red. The other, I made just an hour before we ate it and it was much prettier. Either way the fruit will taste fine. Oh my gosh, I am obsessed! This is seriously too cute! Love it!! I always love to hear when someone really loves something I’ve created. Thanks, Erin! This pizza looks great, Beth! 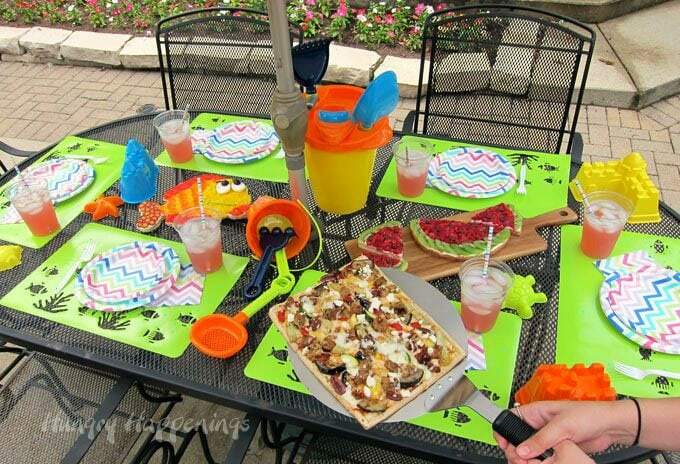 I absolutely love this idea for a summer or beach themed party. Thanks, it was a really refreshing dessert on a very hot summer day. I’ve not yet served it to young kids but the teenagers at our party loved it, as did the adults. I do think young kids will love it too! Thanks, Sarah. Stopping in from Inspiration Mondays – This looks delicious! Now to find a vegetarian substitute for marshmallow fluff! Thanks for the ideas. Thanks for stopping by! If you don’t want to use marshmallow fluff, you can use any type of sugar you like to sweeten the cream cheese. What a unique dessert pizza. And so perfect for summer too… this looks fabulous! I LOVE THIS!!! Pinning now. 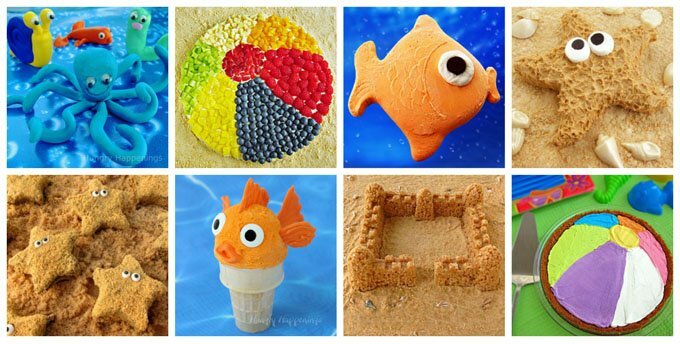 Your creativity is amazing!! I love this…I am always in awe of what you share with us at #FoodieFriDIY. Scheduled several pins, yummed, stumbled, and sharing on my Facebook page tomorrow…and featuring you at the party tonight! I like to pull out all the stops for my favorite posts! Happy (almost) Friday! Wow, Michelle, thanks so much for all the sharing:) That is so nice of you. I hope you have a great weekend. I highly recommend this dessert. My friends asked me to make it for them again! Thanks so much for the feature!!! I’m off to check it out. We dont have Betty Crocker Sugar Cookie Mix in my country. But i want to make this dessert so much. Is there anything i can substitute for it? And if yes how much of it should i make?? Should i do the topping too or not??? Yes, you can use any sugar cookie dough to make the crust for this dessert pizza. I have no idea how much of the dough you will use, so I suggest you just make the entire batch of dough then press it into your pan to see how much of it you’ll need. You can make your crust as thin or as thick as you’d like. You’ll need to adjust the baking time if it’s thicker. I’d just skip the sugar topping. The fruit and fluff will make this dessert sweet enough. Have fun! Hi, thanks for these new ideas! Pinned. Hi, thanks for these new ideas. 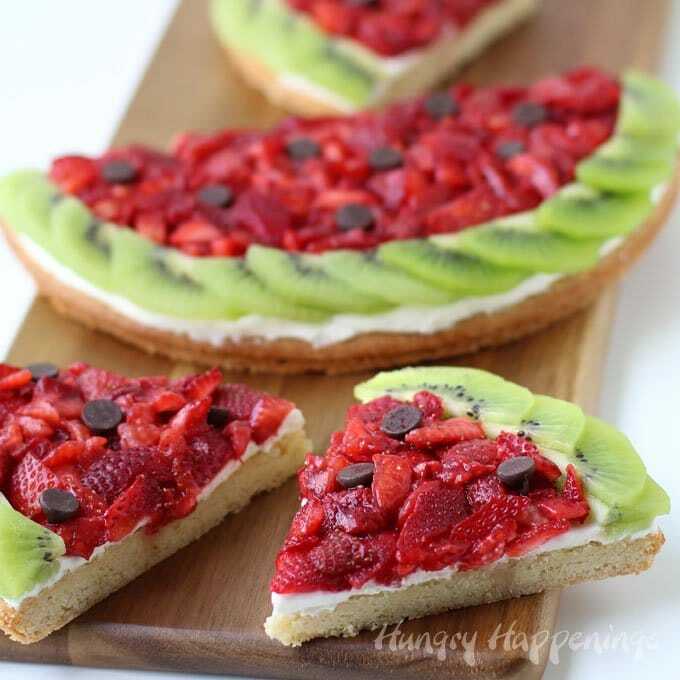 This Strawberry Kiwi Fruit Pizza recipe looks really Yummy! This looks amazing! 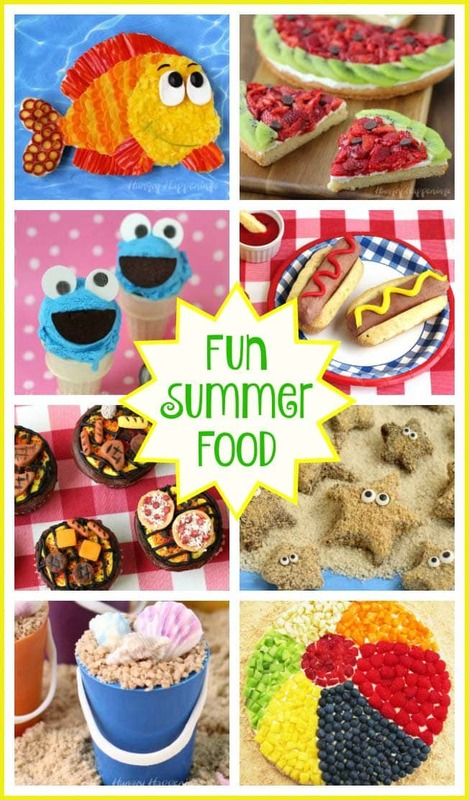 I am going to make this for a cookout I am having at my house tomorrow night! Cannot wait to see how it turns out! Thanks for the recipe!! I’m so happy to hear you plan to make this and I hope it turns out great. Be sure to snap some pictures and send them so I can share them in my Readers’ Gallery! Have a wonderful weekend. Looks amazing! Don’t have a spring pn, can I use a remade pie crust? 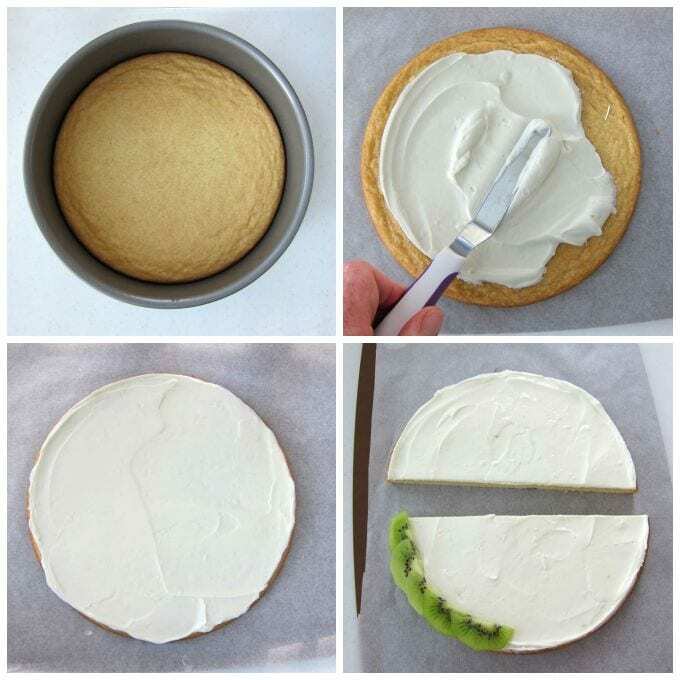 You can use regular round cake pans to make your cookies, just be sure to line them with a round of parchment paper then spray the sides of the pan with a bit of baking spray. I used the springform pans because it is so easy to remove the cookies. If you use a pie crust, your pizza will be quite thin. It will be very difficult to pick up a slice. I would suggest you serve the dessert with forks so that you don’t have to pick the slices up to eat them.